On most college campuses, “the cave” would probably be the spot students seek out for a party. However, at Wichita State University (WSU), it’s a nickname for a high-tech learning center that’s part of the school’s National Institute for Aviation Research (NIAR). 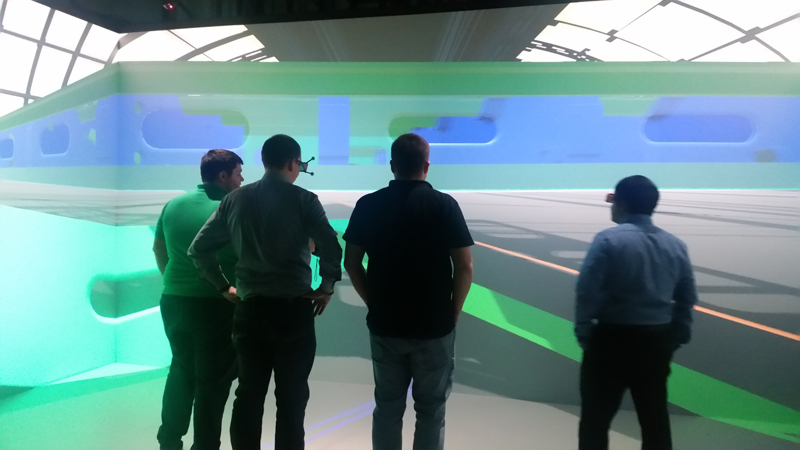 In virtual reality terms a CAVE is an acronym for Cave Automatic Virtual Environment—essentially a room where the walls and floor are used to display computer generated images simulating a real or imagined experience. NIAR provides research, testing, and certification to the manufacturers, government agencies, educational entities, and other clients. 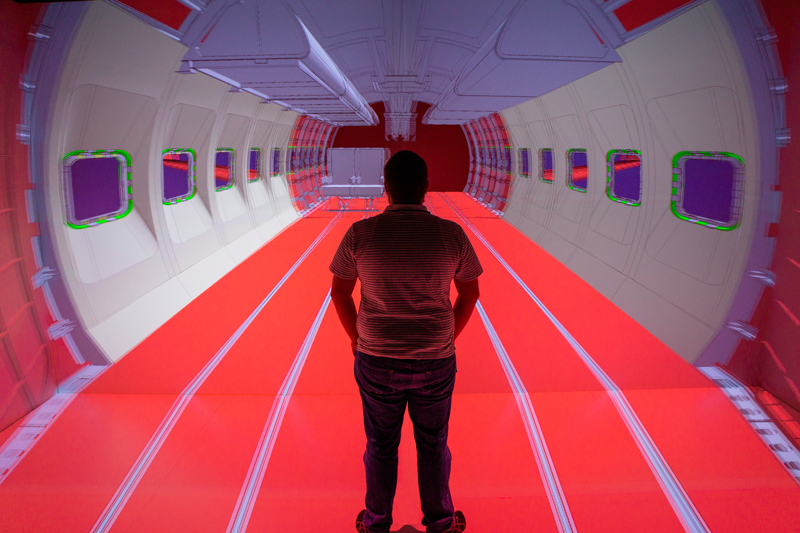 In fact, because of NIAR’s work, WSU ranks first in the nation in industry-funded aerospace R&D., to the tune of approximately $42-45 million per year. 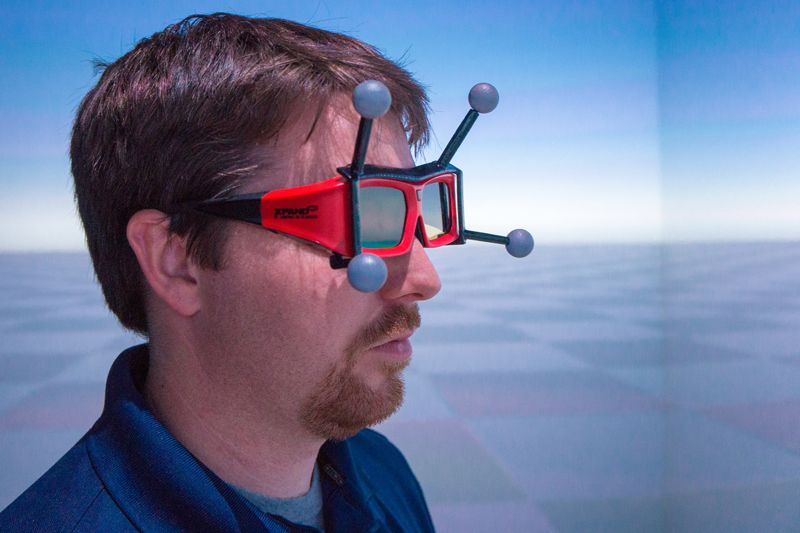 Recently, Wichita State partnered with software company Dassault Systèmes, referred to as “the 3DEXPERIENCE Company”, as well as Mechdyne, a broad-based technology partner specializing in audiovisual and information technologies (AV/IT), visualization and software solutions, immersive virtual reality technologies, and technical support services headquartered in Marshalltown, Iowa. 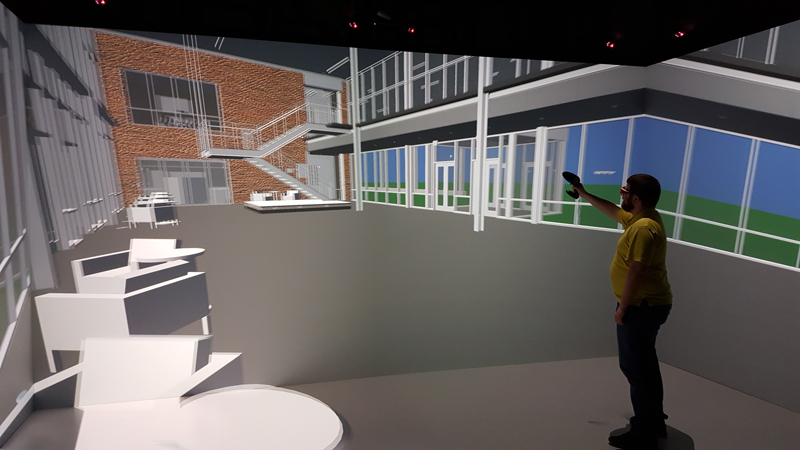 The goal was to create a virtual reality system that would allow designers to experience mock-ups across multiple industries such as aerospace/defense, life sciences, and industrial equipment. Funding for the project was made possible by a 2015 grant from the U.S. Department of Commerce Economic Development Administration. Mechdyne performed the advanced technology solution design, build and integration of Wichita State’s system. Because the entire CAVE experience is based on visuals, the projector choice was key. Fisher and his team knew they wanted high uptime, no lamp replacements, long system life, to conserve facility space, and a realistic color representation. This led them to focus on a solid state light engine that would avoid lamp changes, downtime, and other costly issues. 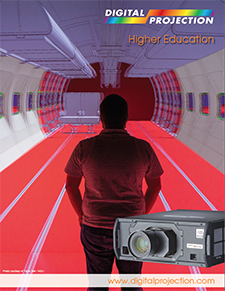 After a visit to INFOCOMM 2015 where all of the leading projection technologies were previewed, WSU selected Digital Projection’s Titan 1080p LED 3D projectors—12 of them. Fisher noted that realistic color was key to their work. 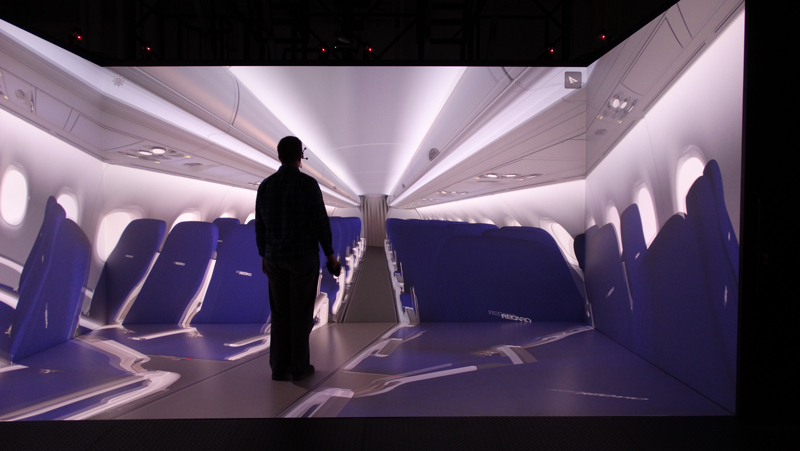 “A lot of our business cases not only deal with manufacturing, but also deal with aircraft interiors, and we needed to be able to show those materials on the screen as close as possible to what you see in real life.” This required a projector with an expanded color gamut. 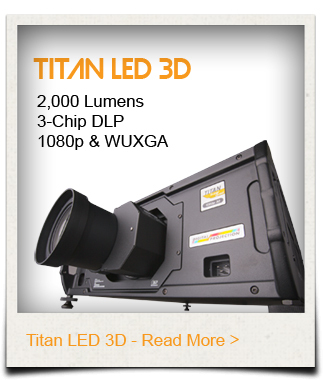 The Titan LED 3D projector combines 3-chip DLP imaging and solid-state LED illumination. It has 2,000 lumens, a 2,000:1 contrast ratio, and stunning black levels. 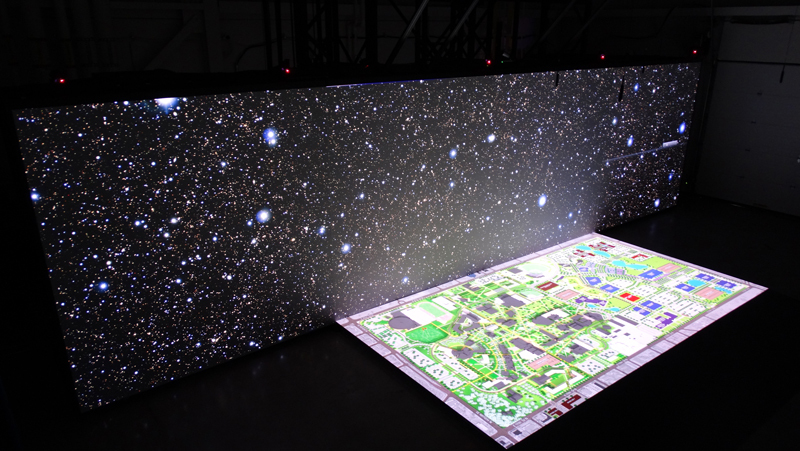 It also features RGB-based LED illumination, which delivers red, green, and blue colors using LEDs versus a lamp that creates white light that separated into RGB color via a prism. The end result produces a lifelike and color-rich visual experience, which is exactly what Wichita State needed. 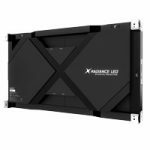 Although the projectors boast a high-def output, the method in which they are combined creates a mixture of 1080p x 1080p and Ultra HD (UHD) images. Visitors can experience UHD images on the front wall and the floor, while a 1080p x 1080p resolution covers the reconfigurable side walls. 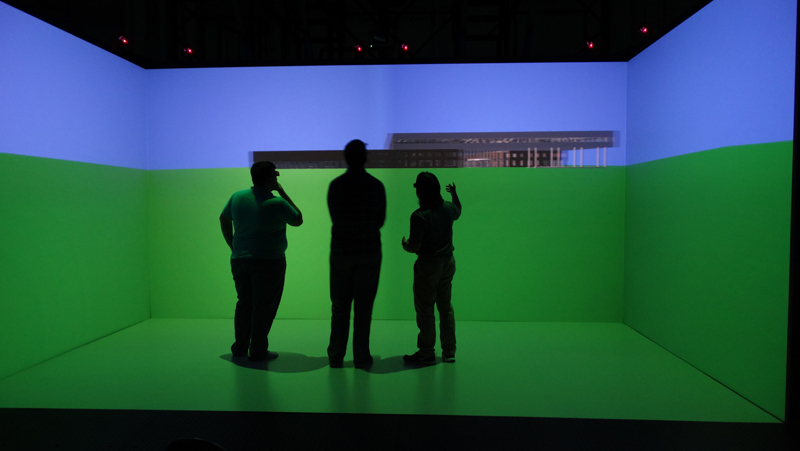 The projectors are just part of the full turnkey solution that Mechdyne designed for Wichita State. 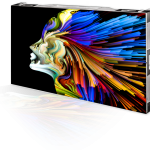 This includes six high-end workstations, with two Nvidia Quadro M6000 graphics cards in each. Other features include Crestron controls, Stewart Filmscreen AeroView projection screens, and more. After more than a year of planning, Fisher said it took less than four days to get the system up and running; partly due to Mechdyne’s staging system, which allowed the Wichita State team to see the system in operation at Mechdyne and make changes before it was delivered to WSU. “We’re using it quite a bit,” said Fisher. That’s one of the reasons why we liked the LED style. With previous systems, we have had to wait to turn them on until the client walks in the door to decrease the amount of use on the lamps. 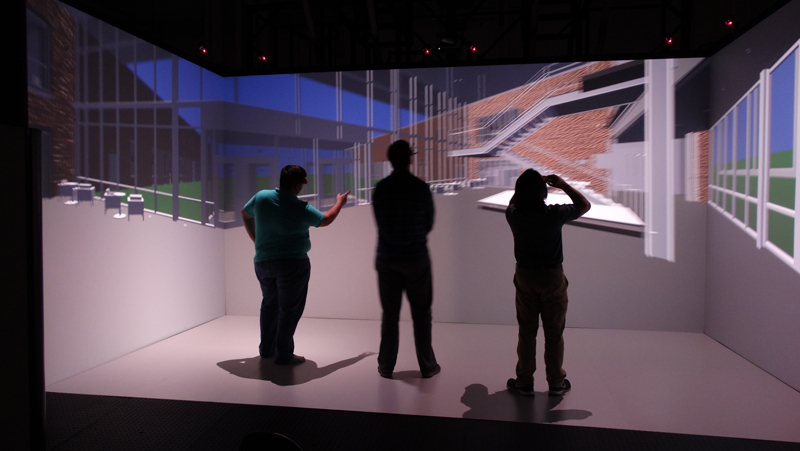 We no longer have that limitation.” The system has been up and running since March, and before the end of the year it will move to the 3DExperience Center inside WSU’s new Experiential Engineering Building. “Only then will we realize the full potential of the combined assets of the CAVE in coordination with the Multi-Robotic Advanced Manufacturing system,” said Fisher.